In the age of technology, businesses are all chasing efficiency. 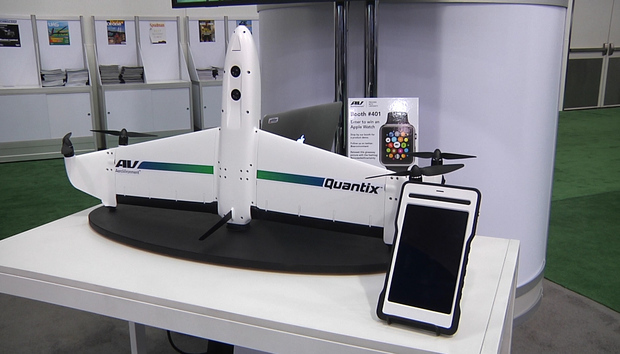 That's exactly what AeroVironment promises to deliver with its new Quantix drone. The technology, a combination of a drone and cloud-based analysis service, can be useful for farmers, says Steve Gitlin, vice president of corporate strategy at AeroVironment. “In many cases, farmers rely on themselves or their people to walk the fields, and if they’re managing large fields in excess of 100 acres or so, then it’s very difficult to walk the entire field in any given unit of time. So they have to rely on their deep experience and sampling." Equipped with RBG and multispectral cameras, Quantix is capable of covering 400 acres of land during a single flight, all the while collecting high-resolution images. The data can be instantly analyzed on the included tablet, which is also used to launch and land the drone with the click of a button. For a deeper analysis, customers can log into AeroVironment's cloud service called Decision Support System (DSS), which is compatible with many of the company's other unmanned systems. Quantix takes off and lands vertically, making it easy to operate, but transitions to horizontal flight in the air, which gives it a longer range. In the U.S., the Federal Aviation Administration still requires that drones fly in operators' line of sight, but if the regulations are loosened, Quantix could be useful for pipeline, road, and power line inspections, Gitlin says, because the drone can cover 40 linear miles in less than an hour. Quantix will be available in the spring of 2017. A price has not yet been announced. Gabriel Cogo (Brazil) - Project Management: Do You Know the Risks? Jeremy D'Hoinne (Europe) - The Door of your Network is Closed, What About the Windows?